Craig Raudman began his racing career at Shasta Speedway (CA) in 1980 in the Street Stock Division. In 2019, Raudman will participate in his last full-time effort, for Dave Reed Racing (DRR), in the SPEARS SRL Southwest Tour Series presented by Lucas Oil. 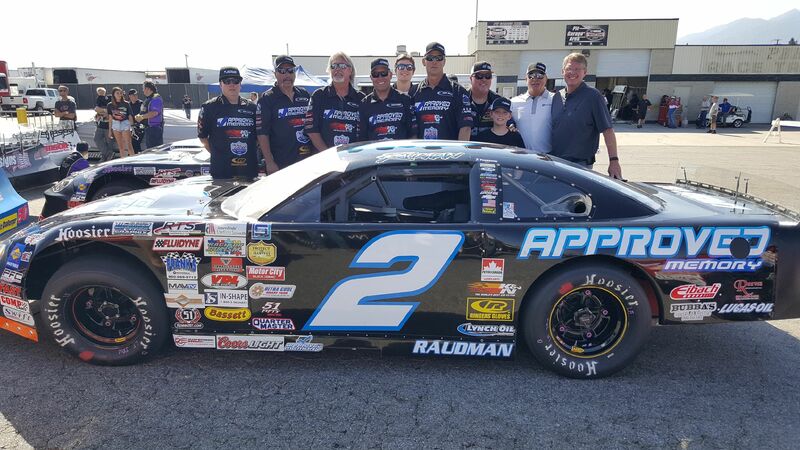 In a career that will span 40 seasons, Raudman is one of the most well-known racers on the west coast, and the black #2 Approved Memory Super Late Model is recognized wherever it goes. Over the last 27 years, most of those seasons were spent racing with long-time friend and car owner, Dave Reed. The two have been friends since 1993, through good times, bad times and brief times apart. Raudman and Reed scored a 2001 NASCAR Southwest Tour Series Championship together and Raudman scored a majority of his 14 career NASCAR Southwest Tour Series division wins with Reed. He also owns his three SPEARS Southwest Tour Series victories with Reed and was elected to the NCARA Northern California Motorsports Hall of Fame in 2016. His first championship was in 1992, where he won the NASCAR Whelen All American Series Track Championship at Shasta Speedway (CA) a year before he met Reed. After 27 years together, this will be Raudman’s last full-time season behind the wheel, and Dave Reed will miss the comradery with Raudman, as he remembered back to their beginnings together. Raudman recalls the race, and the circumstances that led to the beginning of their long-time relationship. Their racing relationship hit the pause button, at that point in time, but they remained friends until Raudman reached out to Reed through a letter and a proposal. As with many long-time racers, Raudman has a variety stories, and just prior to that period, Raudman made some new well-known friends in the racing business. He began the 1993 season driving for Ray Miller. After the fourth event of the season, the Southwest Tour headed to Sears Point Raceway (now Sonoma Raceway (CA)). Do to the circumstances at that event, he made a new friend in Ron Hornaday Jr. It was a friendship that eventually led to Raudman taking over the Victory Circle Chassis Company, from Hornaday. Another Sonoma memory found Raudman with a car, but no motor the following year. He also found himself in a situation, that could affect his first-born son, for the rest of his life. Raudman continued, “At the time, I was married to Stacy, (Raudman’s first wife) who was Chase’s mom. She was six months pregnant at the time, so I told Burney to ‘hold on’, so I went in and told her the whole story. She said, ‘Ya, okay’, so I got back on the phone and said, ‘ya, alright’, So Burney says, ‘It’s a deal’. I don’t think Chase’s first name would be Burney, but it would have been his middle name”, Raudman laughed. His weekend of adventure had only begun, however, as the motor story only got better…., or worse. It was the end of that 1994 season, in which the relationship with Dave Reed and Raudman really came together on the track. That relationship led to their many successes together over the years. Dave Reed fondly remembered some of those times. But like in every relationship there are highs and lows, and for Raudman and Reed, it was no different. As both where reaching their high-point in racing, with their 2001 championship, the bottom was about to drop out, from underneath the long-time friends. Midway through the 2002 Southwest Tour Season, Raudman returned to the track, racing for Les Denherder. The following two seasons, he continued with the same team, finishing the 2004 season as the championship runner-up, scoring two more wins. Through those times, Raudman and Reed remained close. In 2007, Raudman and Reed reunited in the SPEARS SRL Southwest Tour Series, for a single race at Raudman’s home track, Shasta Speedway. They won that race, which catapulted them into a run for the championship in 2008. Raudman came up just short of the championship that season, behind three-time SRL, and two-time NASCAR Southwest Tour Series Champion Jim Pettit II. Following, the duo ran partial schedules over six seasons, but decided to attempt championship bids in 2017 and 2018. Raudman had a good season in 2017, nearly finding victory lane at Madera Speedway (CA). He entered the finale at the Bullring at Las Vegas Motor Speedway (NV), with a good chance at second in the championship standings. A medical emergency cost him the start there, however, and Raudman settled for a seventh-place position in the points. As the end of Raudman’s full-time effort behind the wheel nears, Reed can only look back over their relationship with fondness. For Raudman, the decision to retire was difficult, but it was a combination of different factors that ultimately led to the decision. After a long career driving a race car, Reed is planning a special year for Raudman and his fans, to commemorate the Cottonwood, CA driver’s many successes. He also plans to celebrate a few more successes. In 2020, DRR will enter a new chapter in the organization’s history. The team will continue-on, with leadership from Raudman, Bond Suss and Reed. Preparations for that future will begin this season, with Raudman’s experience playing a key role in the transition. When it comes to his long-time friend and driver, Reed knows Raudman will be missed on the track, and as well as for all the things he has done for short track racing. Reed is also thankful for all those who have helped over all the years. “I would personally like to thank each and every team member that ever raced with us, and their families, for putting up with us and the sport we all LOVE so much!!!!! I’d like to thank our 25-year sponsors; Approved Memory, Ringers Gloves, Peters Racing Engines and Fluidyne Performance. Our 15 plus year sponsors include Lucas Oil, K&N Filters, Eibach, JDA BRE, Coleman Powersports and Bubba’s Rear Ends. Raudman was appreciative of four individuals who were responsible for a majority of his racing success. I’d really like to thank Dave Reed, for his friendship, all he has done for my career, Raudman exclaimed! I’d also like to express my thanks to Ron Hornaday Jr. for giving me a car to dd Peters for all the motor help he has given me over all the years”. When asked about his last full season behind the wheel, and his goals for that season, Raudman knew exactly what he wanted, and went straight to the point.